Recently, I let you know about APhA’s plans for reaching out to the broader public through the media. 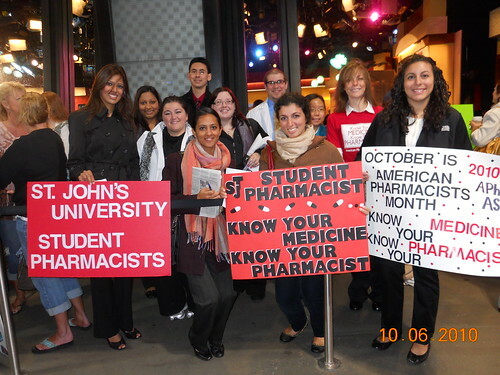 These campaigns saw tremendous success, with more than 200 students from 10 schools of pharmacy participating in the American Pharmacists Month (APhM) “Live from NY” day and, so far, 27 interviews completed by APhA’s media advisors Adam Welch and Kristen Binaso. While reaching out to the public at large with our message is important, we all know that focusing on your immediate community is also a key facet of the “Know Your Medicine—Know Your Pharmacist” consumer outreach campaign. Topics of their Choice—Ask the Pharmacist! As always, I will be conducting personal pharmacy visits in the DC area to meet and get to know a few local pharmacists. On October 13, I will be visiting Kaiser Permanente in Largo, MD, and Walter Reed Army Medical Center’s Wounded Warrior Clinic in Bethesda, MD. An event new to the APhA lineup this year is the USA Science & Engineering Festival. Held on the National Mall, October 23–24, the expo is a huge exhibition of the wonders of the science world. Thanks to a partnership with Walgreens, we will have an APhM booth right on the National Mall. The booth will feature hand-washing demonstrations for the kids and blood pressure screenings for the parents. This event is open to the public, so if you are in DC, you should go visit. If your monthly events aren’t finalized yet, hopefully we can offer a little inspiration. And as always, you can visit www.pharmacist.com/aphm and the APhM Planning Guide.